It came as a huge surprise to even us, but Ethan and Charley and I all packed up and moved over 500 miles away from most of our family and friends, his job, and the towns where we were each raised. And we did this in the span of about two weeks! Later, I will fill you in on some of the details of our move, as well as some of the highlights of our crazy life that y'all missed during my extended (not entirely intentional) blogcation. But for now, I thought I'd share the change of address cards we sent (today, actually) to most of our Christmas card list... since we totally didn't make time for Christmas cards this year!! Thanks to Pinterest, and long before we had any inkling that this move might be happening, I found this idea for handmade paint chip address cards. 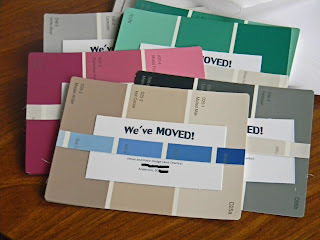 I have a slight major addiction to paint chips, and a huge collection that I have stolen borrowed obtained from Lowe's and WalMart, so I thought to myself, "Hey. It could happen. One day when we're in our nineties, we may leave our sweet little honeymoon home and move into an assisted living facility and want to let people know where to find us. I'll pin it, just in case." I used business card specialty paper that I happened to have laying around for the actual address card. I used a wide paint chip for the background, and a contrasting color for the little strip. I love that hers is an illusion, but I liked the idea of a little more color and I didn't have to worry about how many chips of which colors I had. Stick around - I'll post details, apartment fun, some goals for our new life, and maybe a recipe or two that make us happy people... haha! Love it! I wished I would follow through with the stuff I'd see on pinterest! Sadly, I just pin. ;) I'm excited to hear of your moving journey and glad to see you back!! You're back! Yay! I hope the move wasn't too eventful and I look forward to hearing about it and all of your goals for the future! What Do You Wear on a Day Like Today?